When you go to live and work abroad it is inevitable that you will need to use an internet café, even if it’s just for the first couple of weeks until you get your own internet connection set up. For many people working abroad, using an internet café is the only way that you can get a decent internet connection as a permanent contract requires proof of residence. So unless you are staying in a place where broadband is already included or you plan to stay permanently, you will probably have to use an internet café. These guidelines are written from the perspective of what is the best way to stay safe when using an internet café – you may have to use your own judgement if there is no choice, but try to stick to them as much as possible. That means never tick the ‘yes’ option on ‘keep me signed in’ type messages, and certainly never close a page without logging out first. You really should delete your viewing history after an internet café session too. Unless it is totally, utterly unavoidable, do not go onto your online banking account when you are using an internet café. If you need to contact your bank, phone them, email or text wherever possible. If you phone, do so from a place where you cannot be overheard giving out bank details, too. Even if you are using your own laptop in an internet café, if you’re using their WiFi or broadband, your details can be tracked, followed or even just watched. Yes, there is always someone in the internet café that is having a loud Skype or VOIP phone call, but that doesn’t mean you have to! It’s fine to make chatty calls to your folks and friends, but even then you must be careful not to say too much about yourself, where you live or work or anything else that may be being overheard. This is even more important if you’re calling your bank, airline or any place where you may have to give your name, details (like passwords or mother’s maiden name), bank account details or even just dates when you’re going to be leaving your home empty. Memory sticks (or USB sticks) are so small and affordable that there really is no reason not to have your own. 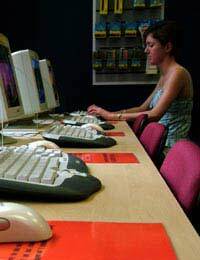 Although practically all internet cafes will lend you a memory stick to transfer or print out documents, it is far better to use your own so your information is not being saved somewhere that you are not in control of – even if you ask for it to be deleted it could be recoverable, so just keep your own. Shopping online from internet cafes is not so bad if you can use PayPal, but even this requires you to input your PayPal password. Only shop online if you absolutely have to, and even then make sure you are only using secured sites – the best way to check this is if the site is a recognised company (go onto the shop site directly rather than clicking through any links), has a padlock sign and has https:// rather than just http:// at the start of its web address.